And as for those who strive in Our path – We will surely guide them in Our ways. And verily Allah is with those who do good. (Ch.29: v.70) The Arabic word Jihad appears in this verse of the Holy Qur’ a n and the word ‘strive’ has been used in its translation into English. The word Jihad is a relatively short word but it has huge implications within Islamic society as a whole and especially for the daily life of the individual Muslim. Jihad, as ordained by Islam, does not consist of killing and being killed but in striving hard to win the pleasure of Allah. Individually and collectively, Jihad is essential for the advancement of our souls. It does not, for one moment, mean that we are ever ready to pick a fight or wage wars. Nothing could be further from the truth and reality. The word Islam means peace and all our efforts and energies should be spent in creating peace and harmony amongst ourselves, our communities and society at large. According to the O x f o r d English Reference Dictionary (1995), the meaning of the word Jihad is given as ‘Holy War’. It incorrectly states that ‘a Jihad may be undertaken to defend Islam against external threats or to spread religion among non believers.’ Holy and war are words definitely not synonymous with each other. In fact they are at odds with each other, for there is nothing holy about the effects and horrors of warfare. It is very unfortunate in this day and age that the word ‘Jihad’ has been so misint e r – 23Review of Religions – September 2002 The Islamic Concept of Jihad By Bilal Atkinson – UK preted by the Western nations and in particular their media. In a way, this misinterpretation is explainable because un- fortunately throughout the last m i l l e n – n i u m, some extreme Muslim groups and their leaders have interpreted the word ‘Jihad’ as Holy War and applied the word to all their wars whether they have been fought for political, economic or expansionist motives. As a result of this misnomer, the religion of Islam has been wrongly accused of procuring converts to the faith by forceful or belligerent means. The word Jihad has been used in two senses in the Holy Qur’an: Jihad-fi-Sabeelillah – Striving hard in the way of Allah Jihad-Fiallah – Striving hard in Allah. The first meaning refers to the waging of a defensive war against the enemies of truth when they seek to annihilate religion while the second means to strive hard to win the pleasure and nearness of Allah. The latter meaning seems to possess a higher spiritual significance than the first. Jihad is of three kinds: 1. Striving against one’s baser self, that is, against one’s own evil desires and propensities. 2. Striving by way of writing, speaking and spending one’s wealth to propagate the truth of Islam and exposing its beauties to the non- believers. 3. Striving against the enemies of truth which includes fighting in self-defence. The Holy Pr o p h e t( s a ) h a s termed the first two kinds of Jihad as the Jihad Akbar (greater Jihad) and the third as the Jihad Asghar (lesser Jihad). Once when he was returning from fighting he is reported to have said: You have returned from the smaller Jihad (fighting against the enemies of 24 The Islamic Concept of Jihad Review of Religions – September 2002 Islam) to the greater Jihad (waging war against one’s baser self). (Khatib) We will initially explain the lesser Jihad or Asghar Jihad before the greater Jihad or Akbar Jihad. The Holy Prophet Muhammad(sa) was forty years old when the Divine call came to him. His first revelation and instruction from the Holy Qur’an was: Recite in the name of your Lord Who created; Created man from an adhesive clot. Recite! And your Lord is the Noblest. Who taught by the pen. Taught man what he knew not. (Ch.96: vs.2-6) This first instruction makes it quite clear that the Holy Prophet(sa) was commanded by Allah to spread the message of Islam by both oral and written means and not by force of any kind, neither by the sword or other aggressive measures. The very first word means to convey the message, to proclaim to the whole world the revelation and teaching of A l l a h ’s word through the auspices of the Holy Qur’an. Soon afterwards the Prophet(sa) was commanded to proclaim widely and openly that which was being conveyed to him. His attempts to convey Allah’s message to those around him in Mecca only drew hostility and ridicule. Initially only four persons believed in him and when this became known to the Meccans they began to laugh and mock. As more verses of the Holy Qur’an were revealed, more people became interested and drawn to this new message, especially the young, the weak and oppressed of Meccan s o c i e t y. Women especially were drawn to this new religion as it offered them both dignity and honour amongst their fathers, husbands and sons, something which they had never experienced before as in most respects they were treated worse than animals. 25 The Islamic Concept of Jihad Review of Religions – September 2002 The continuing success of the Holy Prophet(sa) brought about a backlash against him and the early converts. The Meccans embarked on a course of persecution which grew more cruel and more savage as time passed. They were afraid that the new religion would become firmly established and that their own religion and culture would be ruined. Out of this fear, it was the Meccans, the disbelievers, who drew their swords and took delight in slaughtering the true and faithful servants of Allah over a long period. The streets of Mecca became red with the blood of the Muslims but they did not retaliate. Their humility and steadfastness encouraged their persecutors to be even more cruel and they subjected the Muslims to more extreme modes of torture and floggings. Many parents had to endure the sight of their children being slaughtered before their very eyes and some parents were crucified in front of their children. What made these people accept the Holy Prophet(sa), a man who, at the time was without power or wealth? He certainly did not wield a sword to compel them to accept him and his message. The only ‘sword’ the Holy Pr o p h e t( s a ) possessed was the Holy Qur’an, a spiritual sword, a sword of truth, which naturally turned the hearts of unbelievers without any 26 The Islamic Concept of Jihad Review of Religions – September 2002 WHAT MADE THESE PEOPLE ACCEPT THE HOLY PROPHET(SA), A MAN WHO, AT THE TIME WAS WITHOUT POWER OR WEALTH? HE CERTAINLY DID NOT WIELD A SWORD TO COMPEL THEM TO ACCEPT HIM AND HIS MESSAGE. THE ONLY ‘SWORD’ THE HOLY PROPHET(SA) POSSESSED WAS THE HOLY QUR’AN, A SPIRITUAL SWORD, A SWORD OF TRUTH, WHICH NATURALLY TURNED THE HEARTS OF UNBELIEVERS WITHOUT ANY AGGRESSION. aggression. Such was the beauty, the glory and mag- netism of Islam and Muhammad(sa), who practised and preached Islam, who oozed goodness and love, that they willingly gave their lives to its cause. However, it was the non-Muslims and especially the Meccans who raised their physical swords to attack the Muslims in order to compel them to return to their old religion and customs. After the migration of the Holy Pr o p h e t( s a ) to Medina, the cruelties of the unbelievers from among the Quraish exceeded all bounds. They started to murder those helpless converts left behind in Mecca including women and orphaned children. Although the Prophet(sa) and many of his companions had migrated to Medina, they too were not left in peace. They were contin- uously harassed in that place also. By this time the emerging religion of Islam was surrounded by enemies on all sides and was threatened with complete annihilation. It is in this regard that the first commandment on the lesser Jihad was revealed to the Holy Prophet(sa): Permission to fight is given to those against whom war is made, because they have been wronged – and Allah indeed has power to help them. (Ch.22: v.40) According to scholarly opinion, this is the first verse that gave Muslims permission to take up arms in self-defence. The verse lays down principles according to which Muslims can wage a defensive war. It clearly sets forth the reasons which led a handful of Muslims, without arms and other material means, to fight in self- defence after they had suffered with great restraint, ceaseless persecution in Mecca for years and had been pursued with relentless hatred to Medina where they were continuously harassed and h a r r i e d . 27 The Islamic Concept of Jihad Review of Religions – September 2002 The primary reason the Muslims gave for now taking up arms was that they inferred that ‘they had been wronged’. They had suffered untold persecution and war was actually forced upon them. The very next verse of the Holy Qur’an also lends support to this inference in that it states that permission to fight was given after the Muslims had been driven out of their hearths and homes. 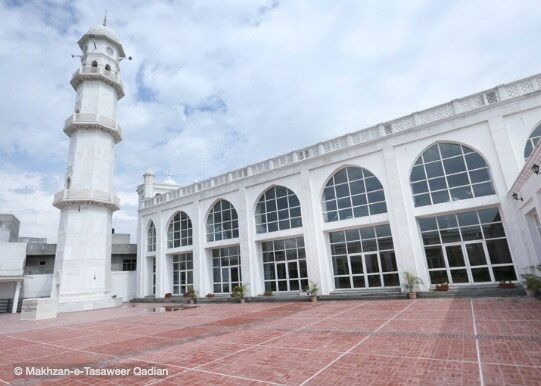 It states: Those who have been driven out from their homes unjustly only because they said, ‘Our Lord is Allah’ – And if Allah did not repel some people by means of others, there would surely have been pulled down cloisters and churches and synagogues and mosques, wherein the name of Allah is oft commemorated. And Allah will surely help one who helps Him. Allah is indeed Powerful, Mighty. (Ch.22: v.41) The Holy Qur’an specifically makes it clear that this type of Jihad is that of fighting only against those who first attack Muslims and other verses of the Qur’an lend support to these conditions. Muslims can only raise their swords to defend themselves against those who first raise hostilities against them and then only if they are oppressed and have been wronged. This is the spirit and essence of Islamic Jihad that has been so maliciously mis-portrayed. It is totally wrong to assume or assert that the Holy Prophet(sa) offered people the choice of conversion or death, Islam or the sword. The Jihad with the sword which the Holy Prophet(sa) and early Muslims had to wage under their own peculiar circumstances was a passing phase in the establishment of the foundations of Islam. Those who sought to destroy Islam by the sword, perished by the sword. Unless a people or nation wage war against 28 The Islamic Concept of Jihad Review of Religions – September 2002 Muslims in order to exterminate Islam, no fight or war in which Muslims are engaged can be called Jihad. The object of the Muslims taking up arms was never to deprive anybody of their homes or possessions or their freedom. It was solely to fight, in self-defence, to save Islam from extermination and to establish freedom of conscience and thought as well as helping to defend other places of worship belonging to different religions from being desecrated or destroyed. In short, the primary objectives of the wars of Islam were to establish freedom of belief and worship and to fight in defence of honour and freedom against unprovoked attacks and this will always be the case, if the time ever arises again. Early Muslims had no choice but to go to war because they were constrained to do so. Aggressive wars were and are still forbidden by Islam. The political power of Muslim Nations must never ever be used for selfish and grandiose ambitions but for the improvement of the poor and the promotion of peace and progress. There can be no greater example of this than when the Holy Pr o p h e t( s a ) and his followers victoriously returned to Mecca. He addressed the Meccans and said: You have seen how true the promises of Allah have proved. Now tell me what punishment you should have for the cruelties and enormities you committed against those whose only fault was that they invited you to the worship of the One and Only God. To this the Meccans replied: ‘We expect you to treat us as Joseph treated his erring brothers.’ Hearing their plea, the Pr o p h e t( s a ) i m m e d i a t e l y declared: ‘By God, you will have no punishment today and no reproof.’ (Hisham) 29 The Islamic Concept of Jihad Review of Religions – September 2002 The Holy Qur’an states: – And fight them until there is no persecution and religion is wholly for Allah. But if they desist, then surely Allah is Watchful of what they do. (Ch.8: v.40) This verse shows that fighting was to be continued only so long as there was persecution and until men were free to profess the religion they liked. If the opponents of Islam stopped fighting then the Muslims were to stop. If any people were ever deserving of any punishment, it had to be the people of Mecca. If Islam was spread by the sword, then this occasion of the Holy Pr o p h e t ’s( s a ) victorious return to Mecca would have been the perfect time to wield the sword for punishment and conversion. But no, the people of Mecca were not converted by force – they were converted by love. Love of the Holy Prophet(sa) and love of the emancipating, enlightening and civilising teachings of the Holy Qur’an. The Holy Qur’an states: There should be no compulsion in religion. S u r e l y, right has become distinct from wrong. (Ch.2: v.257) This verse warns Muslims in the clearest and strongest of words not to resort to force for converting non-Muslims to Islam. It also gives the reason why it should not be used, intimating that the true path has become distinct from the wrong one and therefore there is no justification for using force. 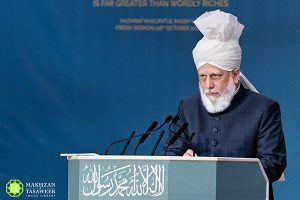 The Holy Prophet(sa) is clearly warned by Allah not to use force in an attempt to reform society. His status is made clear in the following verses of the Holy Qur’an: Admonish, therefore, for thou art but an admonisher; You are not a warden over them. (Ch.88: vs.22-23) 30 The Islamic Concept of Jihad Review of Religions – September 2002 Amazingly, this last verse was revealed in Mecca in the early years of the Prophet’s(sa) call and he was warned in advance that he would gain great power but should not use it for imposing his will on others. 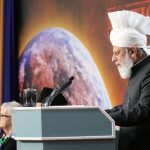 Essentially, the Holy Prophet(sa) did not convert by the sword, but by his righteousness, purity, love and devotion to Allah, which completely overwhelmed his enemies, so much so that those whose intentions were to murder him, were later to lay at his feet and give their lives to save him from his oppressors. 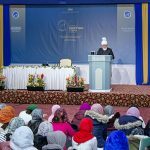 During his last pilgrimage the Holy Prophet (sa), in the closing words of his Farewell Address, said: Even as this month is sacred, this land inviolate, and this day holy, so has Allah made the lives, property and honour of every man sacred. To take any man’s life or his p r o p e r t y, or attack his h o n o u r, is as unjust and wrong as to violate the sacredness of this day, this month, and this territory. What I command you today is not meant only for today. It is meant for all time. You are expected to remember it and act upon it until you leave this world and go to the next to meet your Maker. In conclusion, he said: What I have said to you, you should communicate to the ends of the earth. Maybe those who have not heard of me may benefit more than those who have heard. (Sihah Sitta, Tabari, Hisham and Khamis) The Holy Pr o p h e t ’s( s a ) g r e a t concern for the welfare of the whole of mankind and for establishing peace throughout the world knew no bounds. It is such a tragedy that for the last thousand years or so, many Muslim leaders and Muslim nations, have to a large extent, ignored the true 31 The Islamic Concept of Jihad Review of Religions – September 2002 teachings of the Holy Qur’an and the Holy Pr o p h e t( s a ) t o satisfy their greed and lust for power and material gains. They have fought against each other for these worldly gains and through their injustice, have persecuted the innocent and acclaimed the guilty. They have treacherously betrayed their own countrymen and their fellow Muslim nations and accepted monetary gain, power or property from the enemies of Islam. Most of the spiritual and temporal leaders have misled their own people and brought wholesale corruption of body, mind and soul. In this day and age, some young Muslim men and women have been foolishly ‘brainwashed’ into believing their acts of barbarism, terrorism, suicide and murder will gain them martyrdom. In short, they have brought dishonour to the door of the religion they profess to love. The name of Islam is now equated with terror instead of peace. Most countries of the world have fought political battles but it seems Muslim countries have only ever fought Jihad and in doing so, they have slaughtered one another. 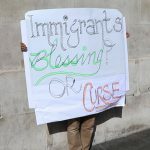 In this regard, it is impossible for me not to mention the events which occurred in New York last September or for that matter the ongoing events in Afghanistan and the Middle East, where so-called ‘Islamic Jihad’ is being waged indiscriminately by extreme Muslim organisations against non-Muslim nations. The Holy Pr o p h e t(sa) w a r n e d that the Muslims in the Latter Days, and especially their leaders, would be far removed from the true Islam and that some would be the worst of creation. These leaders are misleading young, intelligent, Muslim men and women. They have trained and indoctrinated them into believing that if they give their lives, in what they erroneously believe is in the cause of Islam, they will immediately gain Paradise as martyrs of the Faith. 32 The Islamic Concept of Jihad Review of Religions – September 2002 What lies and what deceit! All Muslims should ask them, ‘On whose authority do they make this claim?’ O you young Muslims who are being asked to commit such terrible acts. If, as they say, you will become a martyr and enter Paradise, then surely they should lead the way if what they ask you to do is such a meritorious act. Again, ask of them: ‘Why do you say what you do not do?’ (Ch.61: v.3) Far from being a meritous act, it is an act that is an outrage to the name of Islam and a defiance of the commands of A l l a h . The Holy Qur’an clearly states: O ye who believe! Devour not your property among yourselves by unlawful means, except that you earn by trade with mutual consent. And kill not yourselves. Surely, Allah is Merciful to you. (Ch.4: v.30) The words, ‘kill not your- selves’, prohibit and outlaw acts of suicide. On the other hand, is the murder of innocent people such a meritorious act that will gain a Muslim entry to Paradise? Far from it, it is an open door to the Fire of Hell. Abu Zaid ibn Thabit ibn Dhahak relates that the Holy Prophet(sa) said: He who takes a false oath that if he is not telling the truth he might become a follower of a faith other than Islam is already as he describes himself. He who kills himself with an instrument will be tormented with that instrument on the Day of Judgement. A person cannot offer as a vow that which does not belong to him. Cursing a believer is equal to slaying him. (Bukhari, Book of Good Manners, Chapter – Calling Bad Names and Cursing) So those men and women who 33 The Islamic Concept of Jihad Review of Religions – September 2002 call themselves Muslim and who are contemplating suicide or encouraging others to commit suicide, with a weapon or a bomb, and in doing so, slaughter innocent people, take heed of this verse of the Holy Qur’an and the Hadith of your Master. It is not martyrdom you shall have but the Fire of Hell. Modern day terrorism is contrary to the vision and interpretation of the real spirit of Islamic Jihad. Political wars do not become Jihad. The cry of Jihad is heard again and again and from many different quarters. But what was the Jihad to which Allah and His Prophet invited Muslims? And what is the Jihad to which we are invited today? The Holy Qur’an mentions another Jihad called Jihad-e- Akbar. It states: So obey not the disbelievers and strive against them with it (the Q u r’an) a great striving. (Ch.25: v.53) The great and real Jihad, according to this verse, is to practise and preach the Message of the Qur’an. Ahmadi Muslims have accepted the claim of Hadhrat Mirza Ghulam Ahmad(as), to be the Mahdi and Messiah. He claimed to be a Messenger and a Prophet of Allah, totally subordinate to the Seal of all the Prophets, Muhammad(sa) the Holy Prophet of Islam. He was born in Qadian, India, in 1835 and died in the year 1908. Innumerable signs in his support were given by Allah Almighty and a revelation that his message, that is, the true message of Islam, would reach all corners of the earth. 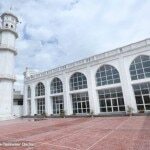 In one of his many addresses to the people of the world, the Promised Messiah(as) stated: You should understand it well that the need of the time is not the wielding of the sword; it is the pen that has to be used. The doubts that our opponents have expressed about Islam and the assaults that 34 The Islamic Concept of Jihad Review of Religions – September 2002 different sciences have made, have drawn my attention to the fact that equipped with the weapon of the pen, I should enter the battlefield and show them the miraculous bravery of Islam and its powers. (Malfoozat, Vol.1, p.57) He clearly states that now is not the time for the wielding of the sword but the wielding of the pen. What does this mean and how do we enter the battlefield to extend an invitation to people to see the real beauties and teachings of Islam? One of the answers lies in the meaning of J i h a d – F i a l l a h o r the Akbar Jihad, the greater Jihad, that is, the Jihad or struggle against our own individual evil designs and propensities and especially our struggle against Satan. This is the true Jihad, an individual Jihad to reform ourselves into pious and godly people and to reform the Satans within us into righteous Muslims so that we are able and well equipped to attract others to the faith. The Holy Qur’an states: – And whoso strives, strives only for his own soul; verily, Allah is Independent of the entire universe. (Ch.29: v.7) This verse gives a very apt description of a Mujahid, that is, a person who strives in the way of Allah. High and noble ideals with consistent and constant effort to carry them out in actual practice is what in Islamic terminology is called Jihad and the person who possesses these noble ideals and lives up to them is a Mujahid in the true sense of the word. 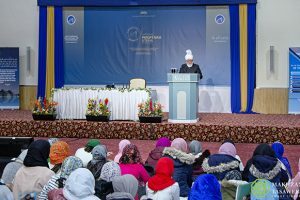 We have to be a perfect model of Islam and for that we need to know the teachings of the Holy Qur’an and the practices of the Holy Prophet(sa). 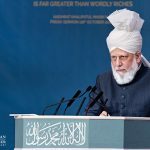 The Holy Prophet(sa) says that the best expression of perfect faith is that other people are always protected by our power 35 The Islamic Concept of Jihad Review of Religions – September 2002 and live in peace. The best Islam or religion is that people are safe from us and that we never harm them with our hands or tongue. (B u k h a r i , Book of Belief) This tradition is a perfect summary and guide to our life in society. It is imperative for every Muslim that their behaviour should be exem- plary and nobody should ever come to harm by them in any way. These things are part of our faith and are, in fact, fundamental to our rela- tionship with Allah. As true believers, we know that the most important goal of our lives is to reach Allah. Our lives are short and before we realise it, they are half gone. We learn from the Holy Qur’an that such a relationship with Allah can be established, but it also says that we need to strive for it. When we look at our physical lives, we can see what kind of striving we go through to achieve success. Surely a similar degree of striving in Allah’s way will lead us to a meeting with Him. We should look into our hearts and see how much time and effort we spend in spiritual matters during the course of the day. Do we spend half or even a quarter of the time spent for worldly efforts? Do our hearts truly yearn for the love of Allah like they yearn for the luxuries of the world? Do we spend a significant amount of time in prayers, in reading the Holy Qur’an, in spending in the way of Allah with our wealth and our time? Do our hearts weep for the 36 The Islamic Concept of Jihad Review of Religions – September 2002 IT IS IMPERATIVE FOR EVERY MUSLIM THAT THEIR BEHAVIOUR SHOULD BE EXEMPLARY AND NOBODY SHOULD EVER COME TO HARM BY THEM IN ANY WAY. THESE THINGS ARE PART OF OUR FAITH AND ARE, IN FACT, FUNDAMENTAL TO OUR RELATIONSHIP WITH ALLAH. welfare of our brother and sister human beings and do we make the effort to go to them in all humility and pass on Allah’s Message? Do we observe the rules and regulations in Allah’s Book? There is no doubt that there are no better or perfect rules or guidelines for our own good and advancement. These rules and regulations are for our convenience. Who can know the best path to Allah, except Allah Himself? We must follow Divine Law to make sure we are protected from exterior and interior evil influences and to enhance our spiritual journey. This is where changes are required in life-long habits and styles. Thoughts and ideas may need to be altered and modified. This may be arduous or painful but all strife and struggles are painful and sometimes tiresome. All people who live by Allah’s rules and strive constantly in His way, themselves become walking examples of godly people. They stand out from the multitude. There is a complete change, both inter- nal and external in their p e r s o n a l i t y, so that people stand in respect and awe of them, because a Divine glow and light shines from their faces. They are a living proof of the Qur’anic verse: And as for those who strive in Our path – We will surely guide them in Our ways. And verily Allah is with those who do good. (Ch.29: v.70) The word Jihad encompasses all the positive activities a Muslim should try to achieve and we should all as Mujahids continuously reform ourselves in all that is good. To strive in the cause of Allah requires great resolve and stead- fastness and this cannot be achieved without true faith, true understanding and belief in a Supreme, All-Po w e r f u l Being and in the certainty of a Life after Death. If a Muslim believes that his faith is the true faith, if his 37 The Islamic Concept of Jihad Review of Religions – September 2002 religion is the true religion, then, if he practices his faith in accordance with its true teachings, he should never be afraid of those who seek to draw him away from his faith. On the contrary, he should welcome them into his home and by his righteous words and deeds, they will, Allah willing, be converted to his faith. Before becoming an Ahmadi Muslim over 14 years ago, I tried for almost two years to convert my Ahmadi friend to C h r i s t i a n i t y. Far from taking or adopting a hostile attitude, he taught me so much about the truth of his own religion in words and practice, that I soon not only fell in love with Islam, I loved the man as a true brother loves his own blood b r o t h e r. He always put his religion and his religious obligations before anything else, including his family. By his righteous words and deeds and by adopting the practice of the Holy Pr o p h e t( s a ), he was able to succesfully call not only me, but many other Englishmen to the true Islam. He performed the true Jihad, not by force, but by gentle persuasion. He had many setbacks on the way, but his patience, steadfastness and most of all his love for his Creator enabled him to be a most successful Caller unto Allah. It is so painful to witness the injustice meted out by some Western nations against Muslims and Muslim nations. It is even more painful to witness the actions of so-called Muslims who declare Jihad against anyone who does not agree with their interpretation of the teachings of Islam and who commit atrocities and shameful acts in the name of Islam. How can they expect to attract non-Muslims to Islam? F i n a l l y, the Pr o m i s e d Messiah(as) has stated: Ignorant maulvis, may Allah guide them, have grievously misled the common people and have told them that such action which is sheer wrong and cruelty and is opposed to all moral values 38 The Islamic Concept of Jihad Review of Religions – September 2002 is the key to paradise. Can it be good action to shoot down an utter stranger who is walking through the street on some errand and who has done us no harm? If this kind of thing is virtuous, wild animals possess more virtue than such men. Glory be to Allah, how righteous were those and how truly inspired by the spirit of the Prophets who, when they were commanded in Mecca not to resist evil though they might be cut to pieces, behaved like hum-ble and weak suckling babies as if their hands and their arms possessed no power at all. How grievous and shameful it is that an utter stranger who has done us no harm and who is occupied in some lawful errand should be shot down without any cause and his wife made a widow and his children made orphans and his dwelling turned into a house of mourning? Which hadith and which verse of the Holy Qur’an authorises such an outrage? Can any maulvi furnish an answer to this question? Ignorant people who have only heard the word Jihad make it an excuse for the fulfilment of their selfish desires. I have brought you a commandment which is that Jihad with the sword has been ended, but the Jihad of the purification of your spirits must continue to be waged. I say this not on my own but in order to proclaim the design of Allah. (Essence of Islam pp. 260-261). 39 The Islamic Concept of Jihad Review of Religions – September 2002 Mr Bilal Atkinson, an Englishman retired from the police service and is the Regional Amir of North East Region, United Kingdom.